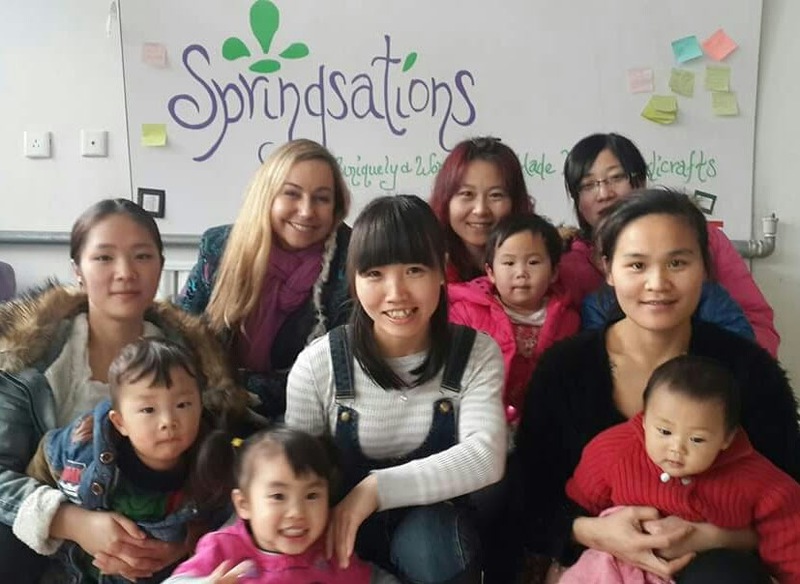 Springsations, is a social enterprise working with Single Mom's in Beijing, China. Springsations; Uniquely & Wonderfully Made is more than just another company making bags, its a company full of compassion, dreams and support. At Springsations, we invest in the people just as much as we do in our products. 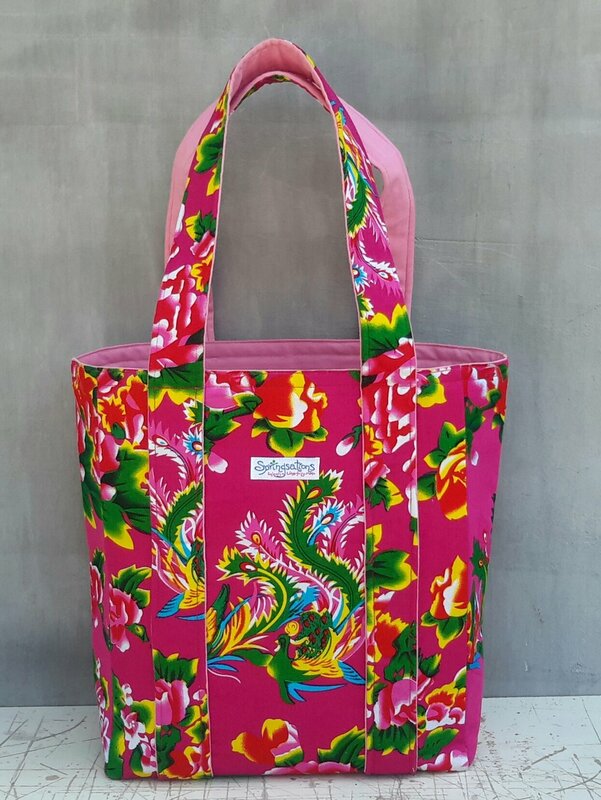 We strive to make a good quality tote that is not only beautiful and unique, but also strong, capable and wonderful (just like our people). Springsations runs a Home for Single Moms & their small children as well as a job training program where the Moms (& other women who'd rather not share about their past) receive training and a job suitable to their skills and dreams. With a little support, Xiao Li is becoming a great mom! Making a Place for single moms & their child. Xiao Li came to us when she was three months pregnant. Rejected by family, friends and baby's father, she turned to us for help. Immediately, we took her in and began looking for a long term solution. We'd hoped to find help for her but the more we looked the less we found. So after much careful consideration we expanded to include a shelter for Single Mom's and their young child. Now, Single Mom's can earn a salary making bags and receive on the job training. We have a child care inside our workshop so they cn be close to their children. Parenting classes, counseling and guidence are alwo provided. With a little love and support, Xiao Li is becoming a great mom. Springsations, was my dream together with a few friends, It started like most dreams, seemed strange or impossible, but the more I dreamed, the more I wanted it! When I shared with a few friends, that I wanted to start making bags, they thought I was a little out of my depth or realm and suggested other jobs might be more suitable. (be careful who you share your dreams with!) But, I pressed on, with a little research and reading, I began to draw a few designs, add some color, and set forth with the help of a few friends. When I started, I just wanted to make some bags and I thought I could also offer jobs to the homeless and use this opportunity to help others too. I had no idea what was around the corner....Soon after we began, a few women in our area asked for jobs, and at the time I needed some help in the office, running errands, and making bags. Everything just kinda developed after that. But, one day not too long after we started the company, a former student came to visit and needed my help. She was three months pregnant and the relationship with the baby's father didn't look like it was going to work out. She was scared, all alone, rejected by her family and friends. After some research and discovery, I learned there are zero opportunities for a single woman who wanted to keep her baby in China. Friends who are more like Sisters! These women become more than just colleagues or friends, they become sisters! In the last few months, these two have become really good friends. I often over hear them sharing parenting advise, sharing food, watching eachother's kids in their time off and helping eachother become better mothers! They both come to work each day with a good attitude and do their best. They correct each other's work, and are beginning to have a higher standard of work & life. They are very proud of their work and I am proud of both of them. When you buy one of our bags you are supporting these women and young women just like them!